It was 1956 when, three years after the introduction of the original Fifty Fathoms model, Blancpain created the Bathyscaphe as a smaller diameter diving watch which could be used also as a daily wearer. In line with the tradition, Blancpain just announced the Ocean Commitment Bathyscaphe Chronographe Flyback, which at 43.60 mm in diameter is smaller than the other models of the Fifty Fathoms Collection. The new diving chronograph features Blancpain’s latest in-house movement, the F385 calibre which utilizes a vertical clutch for the engagement of the chronograph function and runs at the high frequency of 36,000 vibrations per hours. The new automatic movement is also equipped with a silicon balance wheel spiral which, thanks to its anti-magnetic properties, protects the watch from magnetism without the need for a soft iron inner case. This way the watch can be thinner and it is possible to view the movement through the transparent case back. Unlike most diving chronographs, which require that the chronograph pushers be locked down when the watch is submerged, the Bathyscaphe Chronographe Flyback has been equipped with sealed chronograph pushers allowing use of the chronograph during dives to a depth of 300 metres / 980 feet. Useful for divers' decompression stops, the flyback function allows the wearer to stop the first event, return the timers to zero and restart the timing for the second event with a single push of the return to zero pusher at 4 o'clock. Gray ceramic in a matte finish is used for the case, the crown and the chronograph pushers. 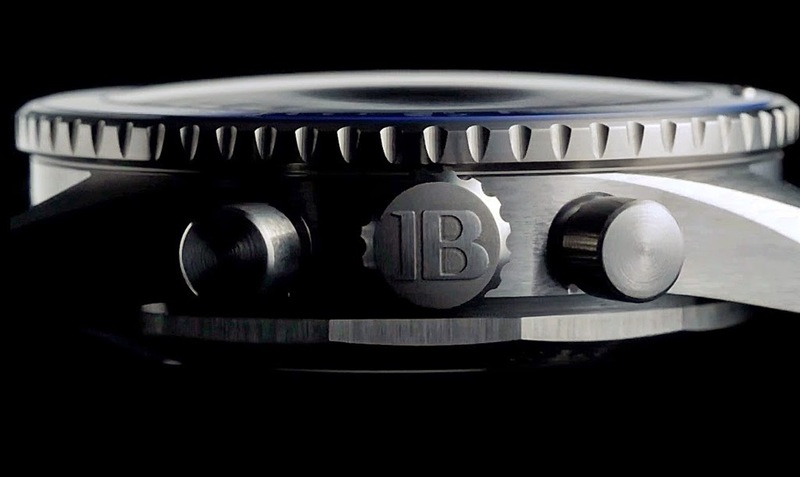 Ceramic in a blue tone is used for the insert of the unidirectional rotating bezel marked with liquid metal indexes. The blue dial offers the chronograph minute and hour counters at 3 and 9 o'clock respectively while the small seconds display is positioned at 6 o'clock. 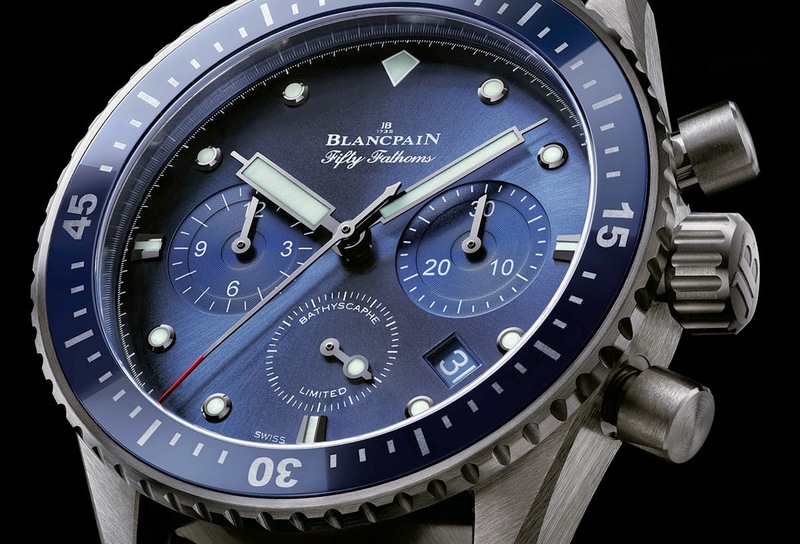 The Blancpain Ocean Commitment Bathyscaphe Chronographe (ref. 5200-0240-52A) is a limited series of 250 pieces. Each purchaser will automatically join the Ocean Commitment Circle created by Blancpain so contributing and reinforcing Blancpain's support for oceanic environmental causes through a donation which will be made for each watch. Blancpain commits to donate 1'000 Euros of the revenues from the sales of this piece to various initiatives. Each Ocean Commitment Bathyscaphe Chronograph Flyback will be individually numbered. In addition, each purchaser of one of these limited edition timepieces will receive a copy of Blancpain’s volume entitled Fifty Fathoms The Dive and Watch History 1953-2013. The copy received by each purchaser will be hand numbered to correspond to the serial number of his watch. 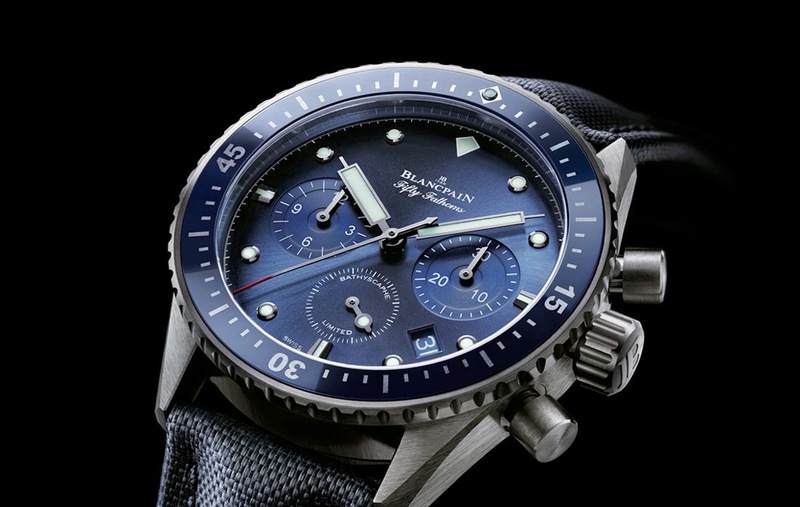 Blancpain Ocean Commitment Bathyscaphe Chronographe Flyback. Blancpain just announced the Ocean Commitment Bathyscaphe Chronographe Flyback, which at 43.60 mm in diameter is smaller than the other models of the Fifty Fathoms Collection. 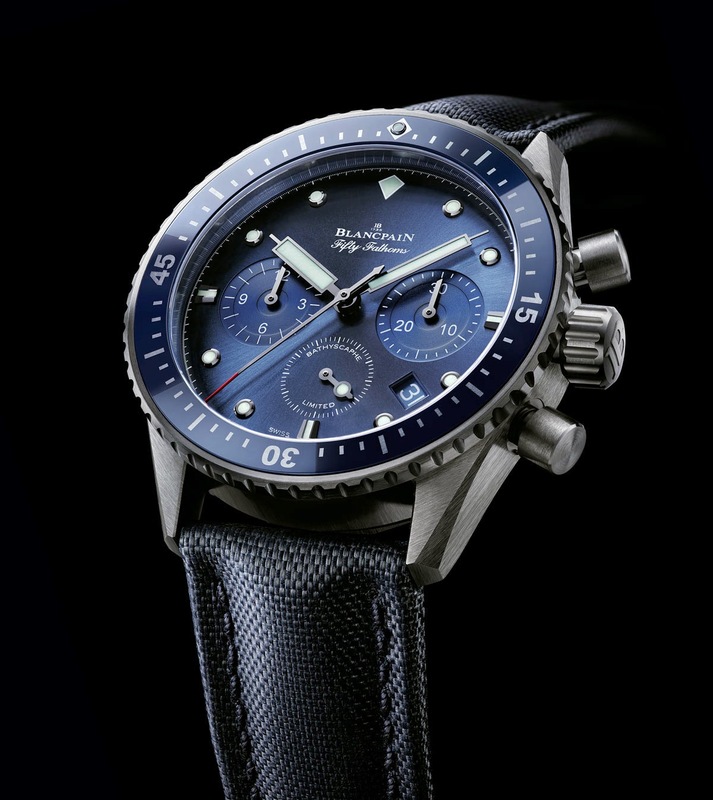 The Blancpain Ocean Commitment Bathyscaphe Chronographe (ref. 5200-0240-52A) is a limited series of 250 pieces.